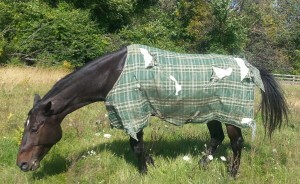 For some horses, the only thing better than getting a cozy new blanket is destroying said cozy new blanket. Today, we honor those particularly troublesome and uniquely loveable horses with some of the most impressive – and confusing – shredded blanket shots from around the web. Got a blanket shredder of your own? 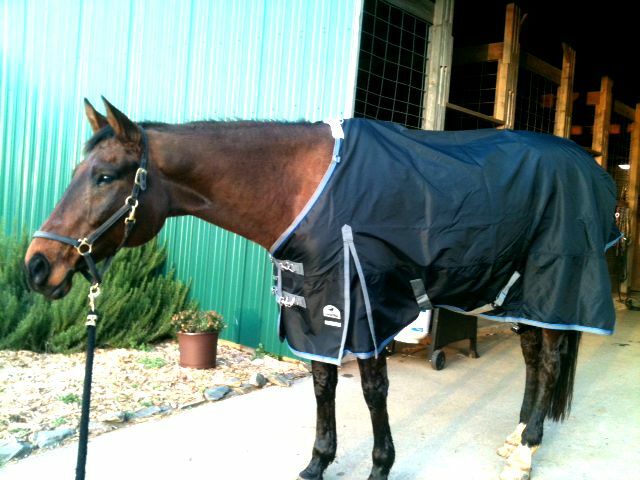 Get the only turnout blanket that’s backed by a 10-Year Indestructible Guarantee – the SmartPak Ultimate Turnout Blanket! While we would never condone violence against blankets, we have to appreciate this horse’s precision and commitment to destruction. 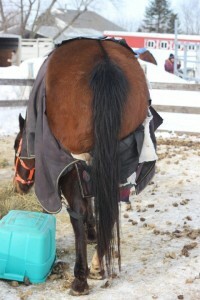 There are so many things to say about this blanket blowout, but we think this horse’s dignity has suffered enough. Not since Janet Jackson at the Super Bowl has their been such indecent exposure. Blankets may be the one thing bailing twine and duct tape can’t fix. We know storage in the barn is tight, but if you keep your horse’s blanket near the sweet feed, he will become a walking bird feeder. You’ve been warned. This serial blanket slayer, Esprit, belongs to our friend Wylie from Horse Nation. 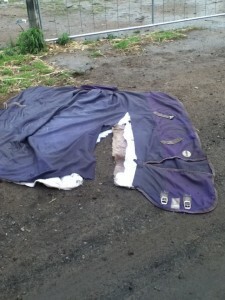 Last year, she put our new SmartPak Ultimate Turnout Blanket to the test, and we’re happy to report that twelve mischievous months later, the blanket is still intact. And we’re confident it will stay that way – after all, it’s backed by a 10-Year Indestructible Guarantee! If you or someone you know is living with a blanket shredder, don’t give up hope. Visit SmartPak and get your horse the only turnout blanket that’s backed by a 10-Year Indestructible Guarantee – the SmartPak Ultimate Turnout Blanket! Happy holidays, and have a great ride! I wash and repair horse blankets for a living and have a deep appreciation for horses who mangle their blankets! about 20 feet: ended up in one, very long, continuous strip! She is athletic and talented!!! I purchased a SmartPak Thinsulate Turnout Blanket for my Arab mare who never gets much of a winter coat and liked it so much I bought another one for my daughter’s QH mare when we had to temporarily pasture board her with no shelter. I didn’t really realize until this winter, though, just how nice it is having really good blankets. We have been rediculously cold here in NW Wisconsin this winter. So I dug out a couple of blankets I ‘inherited’ from a friend and put them on a couple of our other horses. Both survived the 1st night but were literally hanging off of the horses in the morning. 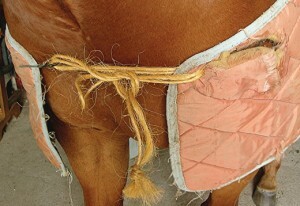 After the 2nd night, 1 was shredded and both were again hanging off the sides of the horses. Never before has there been a winter where I wished I could blanket all the horses with a Smartpak blanket – I’ll be saving to buy more (they’re worth it! )BTW – the 1st one I purchased is going on year 2 and it still looks brand new after I wash it. And it is on my mare almost continuously in the winter. I just purchased the ultimate blanket for my paint gelding “Skittles” I’ve owned him for 1 year and have had 3 blankets for him. I’m not impressed with the looks of the blanket, but if it holds up to his shredding behavior it will be a wonderful surprise. I think Smartpak is going to lose some money on him. Time will tell, today is day one. The last blanket was broken in 2 weeks, he doesn’t mess around he breaks the hardware. I had to go to a blanket made of ballistic nylon to stop the destruction. We are on our second winter with it…so we are hopeful.